Yet another change to weapons is the introduction of martial arts weapons. Martial weapons are connected to a new effect called martial combo. This effect is useful and necessary only when you have a martial weapon equipped (see next section). The martial combo effect earns you automatic extra attacks simiarly to what dual wielding does. Equipping martial weapons and certain equipment will increase your martial combo. On the other hand, heavier armour pieces will lower your level in martial combo. If your martial combo is positive, say <x>, it means that you will automatically make up to <x> attacks instead of 1 when you attack. I say “up to” because the attack sequence will be interrupted if any attack misses (you miss your ‘melee’ roll) or if any attack is blocked (the monster succeeds its ‘block’ roll). This means that to utilize the martial combo fully, you need to have a high melee attribute, and it will work best against monsters that cannot block. If your martial combo drops below one, it is impossible to make a martial attack at all. If that is the case, the game will give a warning that you are ineffective at combat. Quarterstaves. Quarterstaves have always been a quite bland and poor choice of weapon. However, now it is a martial weapon and with a really high melee (+25% bonus!). This makes quarterstaves and their upgrades a very interesting choice if you manage to raise your martial combo. Fists. Your fists are now martial weapons. Katanas. Katanas are a new type of sword that is martial. They are quite similar to regular longswords except that they are martial. So in summary, martial weapons have good and bad properties: The good is that they may be able to stack a lot of attacks in one turn if your melee attribute is high, the bad is that they restrict what kind of armour you can wear. Dual wielding and martial attacks synnergize. Every attack in the martial attack sequence will be a dual attack! This may seem crazy powerful, but remember that the sequence is interrupted if any attack misses or is blocked. In other words: the sequence continues only if both dual attacks fully connects. Starting with dual wielding is already quite powerful, and if fists are now also martial, won’t that make them even better? Well, yes and no. 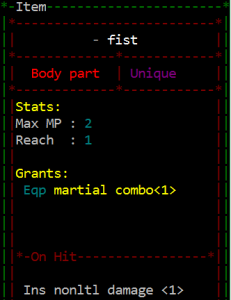 With a high martial combo, some damaging gloves and a boosted melee attribute, the fists may definitely be end-game quality right there. However… starting with a martial weapon restricts what kind of armour you can wear. If you wear anything heavier than leather, your martial combo may be reduced below one, making your fists unsuable. 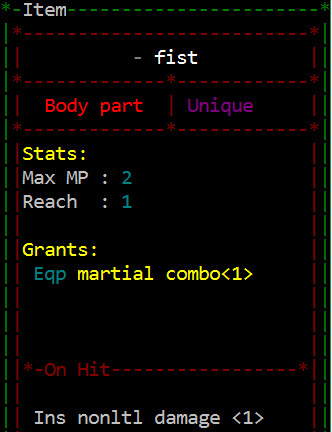 This should hopefully encourage the player to choose one-handed (non-martial) weapons over fists more often. I can see how you want all classic DnD classes being available for play. I kind of like martial arts better. > I can see how you want all classic DnD classes being available for play. Kind of. I took inspiration from the DnD classes to make more distinct playstyles. TGGW already have quite diverse weapons, but with the recent changes (martial arts, thief weapons, blunt/healing, sharp/coating) I hope to get weapon choice matter more for what kind of character you are playing. Happy you like the changes 🙂 Unfortunately starting classes is unlikely to happen in TGGW, as some of the main concepts are to build your character after what you find and to start quickly. However, with recent changes it is easier to “feel” you play a class, since weapon choices in particular are suitable for different kind of play.